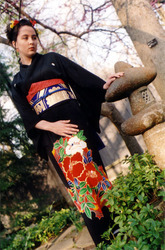 Kerry Porter is a local guest speaker who specializes in the Japanese kimono. Kerry's introduction to the Japanese kimono, came from her childhood in the military. For a number of years, Kerry has researched and studies the art of Kitsuke. Kitsuke is the art, style, and means for wearing traditional Japanese kimono. Kerry offers a large collection of kimono for viewing, and also interaction with. Her workshops and speeches commonly include a live dressing of someone from the audience.